The Fourth of July is next week and Eastlake is getting ready for the annual onslaught of fireworks enthusiasts coming for the Gas Works show. Officers with the Seattle Police Department say their plan for controlling traffic and parking in Eastlake on the Fourth is essentially unchanged from last year. You’ll find the basics on where not to park, when and where access is controlled, and how to get out of the neighborhood after the show is over on the attached PDF map. The fireworks show starts a little after 10 p.m. and runs about 20 minutes. Take a bus to get here if you can. Parking is tight and it’s always easier to get in and out of the neighborhood on Metro. Buses will run on a holiday schedule, which is the same as the usual Sunday schedule. The best time for guests to arrive in the evening is 6 to 7 p.m., says Officer Chris Kelley of the SPD. And the best time for them to leave is after 11 p.m. when the bulk of the traffic is gone. 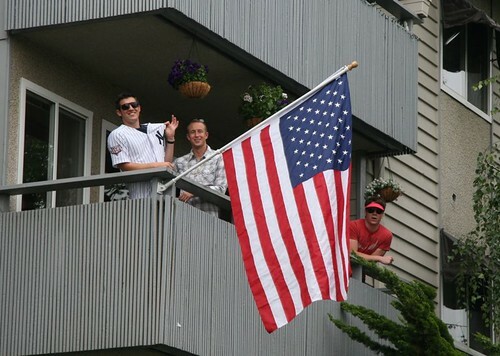 Cellphone coverage in Eastlake can be spotty to non-existent in the July 4 evening hours as thousands of people and their phones jam the area. You should have a backup plan (such as a landline or an Internet-based service) if you know you’ll need to make a call. SPD will be limiting vehicle access to the area from Eastlake Ave. west to the water to try to control the number of people and cars in that part of the neighborhood. After the show, SPD’s goal is to move people and vehicles out of the neighborhood as quickly as possible. Things usually move fairly smoothly after the show but have some patience or wait until the traffic thins out. Click here to see July 4 traffic/parking PDF. Parking along Eastlake Avenue: It’s tight. Parking is totally prohibited on both sides of Eastlake from Hamlin south to Newton from 11 a.m. to midnight on the Fourth. North of Hamlin, you won’t be able to park on the east side of the street. Warning signs will be up and officers will be out and ticketing people on the Fourth. Pre-show limited access: The area west of Eastlake to the water will have limited access during the day (gray zone on the ). During the day, SPD officers will check with people attempting to drive in to that area to make sure they have a place to park and are aware that they’ll be towed if they park illegally. Traffic barricades along Eastlake: On the , you’ll see orange barricades marked on Newton and along Eastlake. Officers will start staffing those positions around 6:30 p.m. Around 7:30 to 8 p.m., they’ll begin to assess the traffic and around 8:30 p.m. they’ll close car access to that area until after the show. You can always walk or ride a bike in to this area. 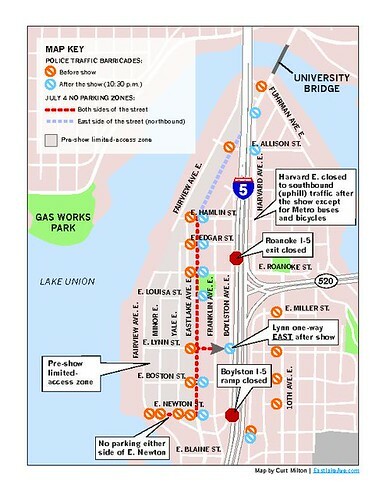 After the show, barricades move from the west side of Eastlake to the east (blue circles on the map). I-5 off ramps: They’ll be closed from 9 to 11 p.m. The Mercer, Boylston and Roanoke ramps are all closed at this time by the State Patrol. The Patrol will reopen them as quickly as possible after the fireworks. 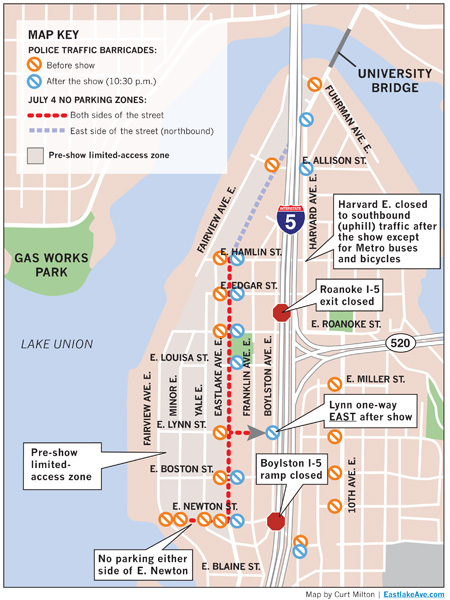 The Lakeview overpass will also be closed to cars and pedestrians during the show. Street flow after the show: Big changes after the show is over. The two blocks of Lynn from Eastlake to Boylston become a one-way street heading east. If you want to go south on I-5, get in the right-hand lane. Want to go north? Get in the left-hand lane. Harvard E. from Roanoke to Eastlake becomes a one-way street going north. The goal of SPD after the show is to move people out of the area, Officer Kelley says. Who ya gonna call? In past years, SPD has told me that if you see someone parking in front of a fire hydrant or blocking a driveway, call the police before the fireworks begin and they’ll take care of it. Don’t call the East Precinct; just call 9-1-1 to report it. Fireworks: They’re illegal inside the city limits. But, folks have them and, as the SPD has said in the past, they just don’t have enough personnel to respond to every incident. If fireworks are potentially causing a fire or a safety hazard, Kelley says to call 9-1-1 to report it and police will take care of it. I’ll be posting the list of Eastlake businesses that are open on the Fourth later this week. If your business will be open, please send me details and I’ll add you to the list. This entry was posted in Uncategorized on June 25, 2012 by cdmilton.